In 5 Steps to More Sustainable Travel, the first action I mentioned was to reduce, reuse and recycle. That can be extra hard on the road, so today I’m giving you a list of tried and true eco-friendly travel products that will help you produce less waste and be a more sustainable traveller. These are the bare essentials that you should pack for every trip to ensure you minimize waste. There are many more depending on your mode and style of travel, but these will take a good chunk out of your single-use plastic consumption and some even save you money in the long term. Disclosure: I may earn compensation from the purchase of any product linked on this website, at no extra cost to you. I only link to products I use and love, therefore feel comfortable recommending. Bottled water can cost up to 10,000 times more per gallon than tap water. According to IBISWorld, approximately 2.7 billion kilos of plastic bottles get thrown away every year in the U.S. alone, and only about 30% of them are recycled. Take a reusable water bottle and fill up at your hotel restaurant or other trusted water source and you’ll not only save money on buying bottled water but help save single-use plastics from landfill. If using a disposable plastic bottle is necessary, make sure it ends up in a recycle bin. I use… the Platypus Meta Bottle 1.0L , which is a partially collapsible water bottle, with a built-in microfilter (note the difference between filtration and purification). The Meta isn’t overly simple to collapse, but it does strike a nice balance between a bladder-style bottle which is hard to clean, and a traditional water bottle. If you love your hot beverages, then you will be horrified to learn that Americans throw away 25 billion coffee cups every year. Australians use 1 billion disposable cups annually and the UK churn through 2.5 billion annually. I use… the Zojirushi Stainless Steel Vacuum Insulated Mug which is more of a mini thermos than a travel mug, but that’s what I love about it. I can throw it in my bag with confidence and it keeps drinks cold or hot for hours. When not using it for a cup of steaming coffee or tea, I use it as a secondary water bottle. It’s so compact, I can slide it into my handbag. If you’re the kind of traveller who packs their own lunch to take on adventures, then skip the plastic wrap and zip lock bags, and use something reusable. I use… beeswax wrap and a slimline lunchbox to store food when going on day hikes. The Bee’s Wrap Reusable Food Wraps are good for wrapping sandwiches, fruit, vegetables, cheese and bread, whether you’re home or away. The Monbento Original Bento Box is a compact alternative to those chunky Tupperware containers you took to school as a kid. Monbento is making packed lunches cool again, with their sophisticated French design and quality, BPA-free plastics. Plastic cutlery, straws and paper napkins are really hard to dodge. A lot of the time you are given these items without asking for them. Don’t be shy in asking for beverages without staws and napkins, or turning down cutlery (as long as you brought your own of course). I use… a cloth napkin from an old picnic set and a fork, knife and spoon from my kitchen. However, if you are travelling carry-on only silverware can be a problem, so I also have these To-Go Ware Bamboo Travel Utensils . 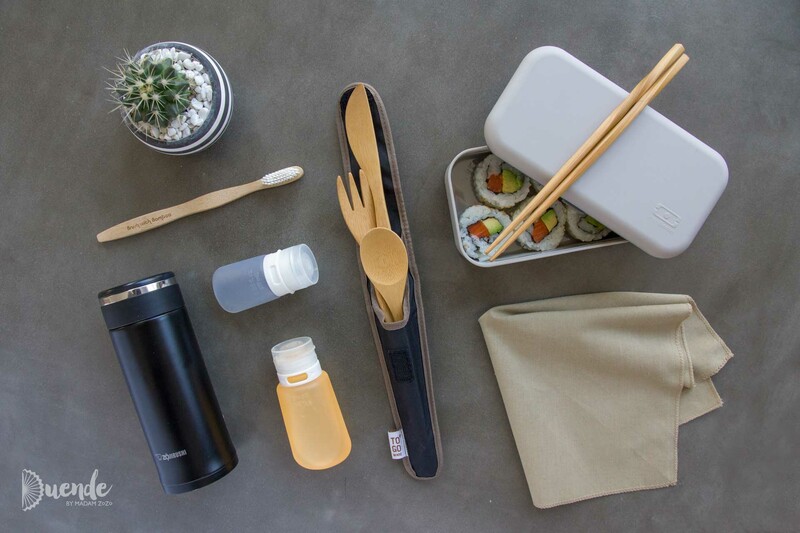 The set includes chopsticks and comes in a compact sleeve with a handy carabiner. There are a few straw alternatives out there, but ask yourself, do you really need one? Those mini versions of your favourite bathroom products are convenient, but they are expensive and the plastic containers/wrapping are just another item that will end up in landfill. Buy your regular size products or bulk containers to use at home and refill reusable containers to take on the road. I use… Humangear’s GoToob products, which come in three sizes that comply with carry-on liquid requirements. I’ve had my original set of Humangear GoToob Large (3oz) tubes for close to a decade and they are as good as new. I now have a set of smaller, 1.25oz size tubes as well. The wide opening makes refilling them easy, and I’ve never had a leak. I put almost everything in them: moisturizer, body wash, face wash, sunscreen, coconut oil, shampoo and conditioner. Those ziplock bags you use for your carry-on liquids weren’t meant to be used repeatedly, and it shows after just a few trips. A sturdier, airline approved bag will again cut down on your single-use plastic consumption. I use… one of these TSA Approved Clear Travel Toiletry Bags with a wide, stand up bottom that makes them a much better design for your toiletries. Americans discard approximately 850 million toothbrushes per year and Australians dispose of 30 million. That’s a lot of plastic, and the kicker is that because it takes so long to degrade, every piece of plastic ever made still exists! There are some more eco-friendly alternatives to plastic toothbrushes on the market, though none is perfect – replacing plastic bristles seems to be a stumbling block. I use… the Bamboo Toothbrush by Brush with Bamboo which has plant-based nylon bristles. Although if you like a soft brush, you may find the bristles too hard. You may instead prefer the Preserve Adult Soft Toothbrush , with a handle made of recycled yoghurt containers. Ladies, it is approximated that you will use 12,000-period products in your lifetime. That’s not only a lot of waste but a lot of money too. Menstrual cups are fabulous, waste-reducing, money-saving alternatives. They are simple to use and depending on the size of your purchase, have roughly three times the capacity of a tampon. That means you can wear it all day and not have to change tampons/pads in a filthy public toilet, or worse, a squat toilet! Cups can be used up to 10 years, which saves tonnes of waste. I use… the Ruby Cup. Other reputable brands include Diva Cup made in Canada, LENA Menstrual Cup made in the US and Juju made in Australia. Replacing disposables doesn’t need to be that hard, you just need thoughtfully designed alternatives to take their place. These eco-friendly travel products will dramatically cut down on what you throw away, and on most occasions, will save you money over the long term. Let me know how you go about reducing waste when you travel in the comments below. Also, see 7 Sources to Shop Your Sustainable Travel Wardrobe for more on eco-friendly travel.